Ms. Zainab Ahmed, our Kindergarten Green teacher, has over nine years of teaching experience. She earned her master's degree in Fine Arts and has a Certification in Montessori training. 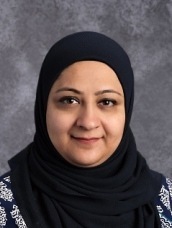 This is her fifth year teaching at Al Fatih Academy. During that time she has worked as both a lead and assistant Kindergarten teacher. She has also taught Art. Her philosophy is to provide an interesting, challenging, learning environment where her students will flourish socially and academically. Besides loving her job, Ms. Zainab enjoys spending time with her family, painting, creating pottery, and reading. She is looking forward to another rewarding year here at Al Fatih Academy!